18 Jan, 18 18 Jan, 18 - by TAR - 3 Comments. 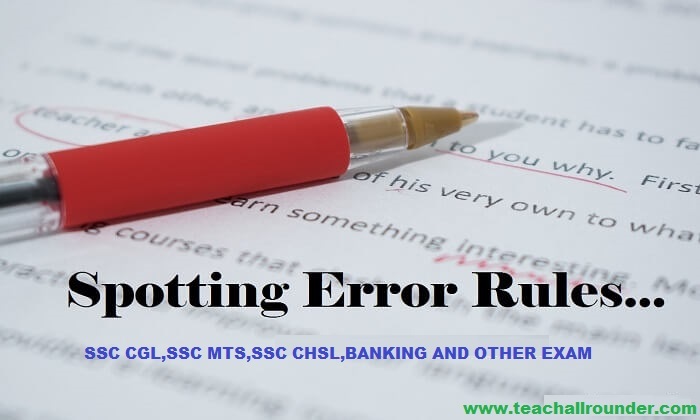 Hi readers,Here given basic rules which are useful for spotting errors. 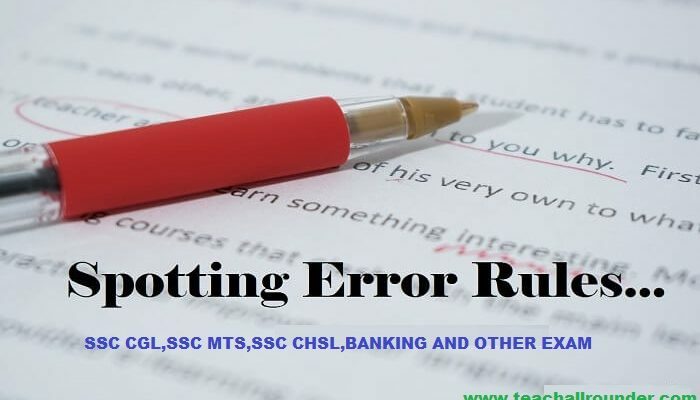 Spotting the errors are interrelated with the grammatical formation which further relates to the parts of speech. 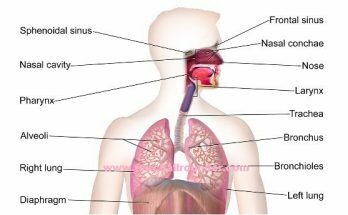 Usually, the error may be pertaining to the usage of parts of speech, which can be broadly described under the following points. 2. Noun Kinds of Noun, Gender, Number, Person, Noun case etc. 3. Pronoun Cases, kinds of Pronoun, different forms and its appropriate rules likewise, Some, Who, What, Which, That, Whose, Any, Whom, Each, Other, One other etc. 4. Adjective Kinds of Adjective and its patterns, various usage like positive, Comparative, Superlative degrees etc. 5. Adverb Kinds of Adverb and its appropriate usages, comprising certain forms. 6. Tenses Grammatical rules of entire tenses (Present, Past, Future, Translation) and its appropriate application. 7. Preposition Various usages of Preposition In, On, Over, Into, Out, Behind, Among, Over, Off, At, Of, Across, Under etc. 8. Conjunction Its various usages basically, Neither ….. nor, Either …… or, Because, Not only ……. but also, Scarcely, Barely, Hardly, When, Although, But, And, No sooner ……. than, such ……. as, So …… that etc. 9. Subject-verb Agreement It is one of the crucial parts, which a candidate should keep focus upon and they should learn the correct grammatical co-ordination of subject and verb. Article A or An is used before a singular noun. The choice between A or An is determined by the first sound of pronunciation (not by the letter of alphabet even it may be A, E, I, O, U) of the noun. If it is pronounced with a vowel sound, use An otherwise A.
a) He is an honest man. b) He is a European. c) He is an MLA. d) He is an SDO. The following words and the use of ‘A’ or ‘An’ before them. Students generally make mistake using A or An before these words. 1. While speaking of a particular person or thing or one already referred to. Example She found a purse. The purse contained a golden chain. The golden chain is very precious. Example The dog is a faithful animal. 3. ‘The’ is used before superlatives. Example She is the most beautiful girl in our college. 4. ‘The’ is used with the names of renowned building , gulf, river, ocean, sea etc. Example The TajMahal, The Persian Gulf, The Char Minar, The Pacific, The Ganges, The Red Sea, The Yamuna, The Thames. 5. ‘The’ is placed only before the plural names of islands and the mountain ranges, chains of mountains, plural names of countries. Example The Netherlands, The Philippianes, The Bahamas, The Laccadive islands, The Himalayas, The Alps etc. 7. ‘The’ is also used before names consisting of noun + of + noun. 8. ‘The’ is used before the adjectives east/west etc. + noun in certain names. 9. ‘The’ is also used before the name of directions. 10. ‘The’ is used before then name of persons (Family) in plural. 11. Before the names of important and renowned books. But we say- Homer’s Iliad, Valmiki’s Ramayana, Jaidev’sGeetGovind. 12. Before such common nouns that are names of things unique of their kind. a) The sky is dark and the moon is shining. b) The sea seems calm today. a) We go to sea as sailors. ii) We can use ‘the’ before ‘Space’ if it means place. He tried to park his car there but the space was too small. But if it means area beyond the earth’s atmosphere, do not use ‘the’ before it. Example There are lacs of stars in space. 13. Before terms referring Nationality or Community. 14. Before a proper noun, only when it is qualified by an adjective. Example The great Caesar, The immortal Shakespeare, The brave Napolean. a) He was the first man to stand up. b) The sixth chapter of this book is very interesting. First, second, third …….are called ordinals. One, Two, Three ……..are called cardinals. 16. Before Musical instruments and name of Inventions. a) He can play the flute/ the table/ the harmonium well. b) Who invented the telephone? 17. Before an adjective, when the noun represents a class of persons. a) The young will support the motion. b) The poor can be trusted. 18. Before a common noun to give it the meaning of an abstract noun. a) The moralist in Gandhi, revolted against the injustice. b) The judge in her prevailed upon the wife and she sentenced her husband to prison. 19. ‘The’ is used before name of Newspaper, Community, Political Party, Historical event, Train, Ship, Aeroplane etc. 20. When two or more nouns refer to one person, put ‘the’ before the first noun only. If both the nouns refer two different persons or thing, ‘the’ is used before both of them. a) The producer and financier was present there. b) The producer and the financier were present there. 21. ‘The’ is used as an adverb with a comparative. a) The more she gets the more she demands. b) The sooner you complete the better it is. 22. ‘The’ is used before comparative degree being used for selection or comparison. a) He is the stronger of the two. b) This is the better of the two novels. 23. When a person being referred by his designation, ‘the’ is used. The Chairman, The Director, The President, The Chancellor. Example All financial decisions will be taken by the chairman. 24. When the thing referred is understood. 25. ‘The’ is used in some phrases also. a) What is the matter? b) Come to the point. c) She came to the rescue. d) Keep to the left. e) The market is hot with the rumour. f) He is in the wrong. 26. In phrases; Go to the cinema, Go to the theatre ‘the’ is used. a) He went to the cinema yesterday. b) She is going to the theatre. 27. Before the names of Committee, Club, Foundation and Trust. Examples The Lions Club, The Rotary Club, The United Nation, The WHO, The Ford Foundation, The Rajiv Gandhi Trust etc. Students should learn the following points carefully to avoid the wrong use of articles. Articles the wrong use of articles. Example Akbar was a great king. When ‘Article’ is used before a proper noun, it becomes a common noun. a) Mumbai is the Manchester Of India. b) This man is a Second Sachin. 2. before a Common Noun, used in its widest sense. b) What kind of bird it is? 3. before Plural Nouns referring a class in a general sense. a) Bankers are generally honest. b) Lawyers are generally intelligent. 4. before Abstract Nouns that express qualities, state, feeling, actions. a) Honesty is the best policy. b) Virtue is its own reward. When abstract nouns, instead of referring qualities, express person or things possessing such qualities or express of definite objects. They are preceded by Article. a) Iron is a hard metal. b) Silver is a semi-precious metal. When material noun expresses things instead of the matter of which they are made they are representing ‘common noun’, so they can be preceded by the Article. a) He threw a stone on the cow. b) She threw a stick at the pig. 6. before names of diseases like Fever, Cholera, Consumption etc. 7. before name of regular meals. Example He was invited to dinner. Example The dinner hosted by the queen was superb. a) He was condemned to hell. b) The Pope delivered a religious speech. a) I do not know ‘Hindi’ but know ‘English’. b) I like red and blue colours. 10. before certain titles and names indicating the relationship. Emperor Ashoka, President Bush, DewanBahadur. a) Prince Charles is Queen Elizabeth’s son. b) President Kennedy was assassinated in Dallas. c) Dr. Watson was ‘Sherlock Holmes’ friend. d) He is Duke of York. a) What kind of girl is she? b) What kind of boy is he? To take breath, to set sail, to leave school, to lay siege, to catch fire, at home, in hand, at school, by water, at sunset, on earth, by land, by train, by car, on demand, in debt, in jest etc. 13. before nouns, which are plural in their meanings, though singular in form. Cattle, gentry, furniture, scenery, advice, information. 14. before names of public institutions (Church, School, University, Prison, Hospital, Court etc.) if they are used, for the purpose they exist rather than actual building. 15. When two or more descriptive adjectives qualify the same. noun and adjectives are connected by ‘and’ the Article is used before the first adjectives only. Example This is a Hindi and English Dictionary. 16. If two nouns refer to the same person or thing, the article is used before the first noun only, but if they refer to different persons or things, the article must be used with each noun. a) He is a better soldier than statesman. b) He was a greater soldier than a stateman. 17. Article is omitted after the possessive case. Example His brother’s car, Peter’s house. 18. Article is omitted with professions. b) He’ll probably go into medicine. 19. Article is omitted with years. a) 1947 was a wonderful year. b) Do you remember 2000. 20. No article is used before names of games, sports. a) I am playing cricket. b) He is fond of playing tennis. 21. No article is used before a noun when it is modified by either possessive adjective or a demonstrative adjective. 22. No article is used before a noun when it is preceded by a distributive adjective. 23. No article is used before number + noun. a) The train arrives at platform 7.
b) I want shoes in size 10. 24. Work (=place of work) is used without definite article ‘the’. a) He is on his way to work. b) She is at work. c) They haven’t back from work yet. 25. Office (=place of work) needs ‘the’: He is at/ in the office. To be in office (without the) means to hold an official (usually political) position. To be out of office= to be no longer in power. 26. Definite article ‘the’ is omitted when speaking of the subject’s or speaker’s own town. a) We go to town sometimes to meet our mother. b) We went to town last year and remained there for a week. 27. ‘Nature’ when means environment, do not use article before it. Example If you interfere with nature you will suffer for it. 28. No article is used before names of ‘season’. a) In Spring we like to clean the house. b) She is planning to visit her parents in winter. 29. Definite article ‘the’ is not used before ‘Times of day’. a) We travelled mostly by night. b) We’ll be there around midnight. Names of many places especially names of important buildings and institutions consist of two words. First word is usually the name of a person or a palace, we do not use ‘the’ before such names usually. Example Delhi Airport, Victoria Station, London Zoo, Jaisingh Palace, Indira Gandhi Airport, Edinburgh Castle, Jaipur Palace etc. 31. Usually no article is used with the name of Airlines, Companies. British Airways, Sony, IBM, KODAK, Indian Airlines etc.